Brought to you by the same relatives who produced the best blasphemous birthday gifts, I now show you my new awesome Christmas gift: Look familiar? I’ll help you out: Yep. 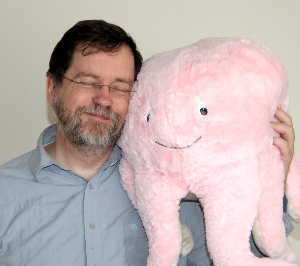 Chris and Erin got me the same awesome, soft, cuddly, adorable octopus plushie from the PZ photo. And it wasn’t a coincidence – they got it because they know I love PZ’s blog and would know the photo. The funny part is when I walked in and saw an octopus plushie under the tree I exclaimed, “Man, I want that!” thinking it was for my nephews (since 99% of the presents were for them, naturally). At the time I didn’t recognize exactly which exact plushie it was, since it was upside down and half buried by the twins’ toys. Later on I was telling Erin how awesome it was, and she went “Well good, because it’s for you!” Yaaaay!